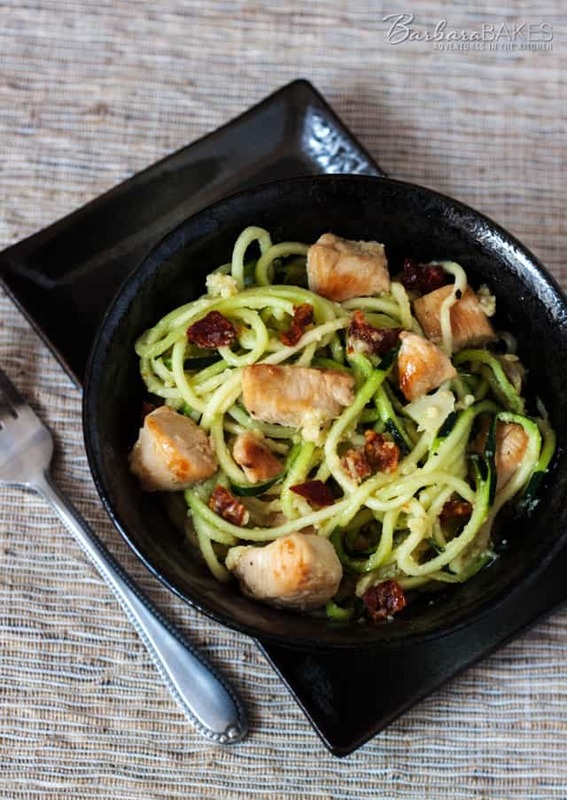 Zucchini noodles quick fried with chicken and sun dried tomatoes in an easy-to-make, flavorful artichoke lemon pesto.
. The noodles make a great substitute for pasta when you’re trying to eat less carbs. Recently I was at Sprouts buying zucchini to make noodles. I’d planned on serving the zoodles with a traditional basil pesto, but decided to try an Artichoke Lemon Pesto they were selling. My husband and I loved it. It was so bright and fresh and flavorful that my husband said I should post the recipe. I didn’t want to post the recipe using the store bought Artichoke Lemon Pesto, so I bought the ingredients and recreated it at home. The pesto recipe makes twice as much pesto as you need for the recipe, but it’s great with sautéed vegetables too. I added sun dried tomatoes the second time I made the recipe to add a pop of color and because I loved them. This meal comes together really quickly. Just be sure and use a hot skillet so you get good color on your chicken and so the zoodles get hot quickly without getting too soft. Season chicken with salt and pepper. Heat olive oil in a large skillet over medium high heat. Add chicken and cook until cooked through, 3 -5 minutes. Add half of the pesto, sundried tomatoes and zucchini noodles and toss to combine. Cook until noodles are hot, 2-3 minutes. Serve immediately. If you’re looking for more Zoodle recipes, Kalyn has a great Zoodle Pinterest board. Wow this is so cool! I haven’t tried zoodles yet but now I really want to. Looks delish!!! Zoodles are my new favorite thing! Yum! I haven’t tried zoodles yet but hubby is trying to stay away from carbs. I’ll try this soon. What a great idea! I am going to make Zoodles, soon! 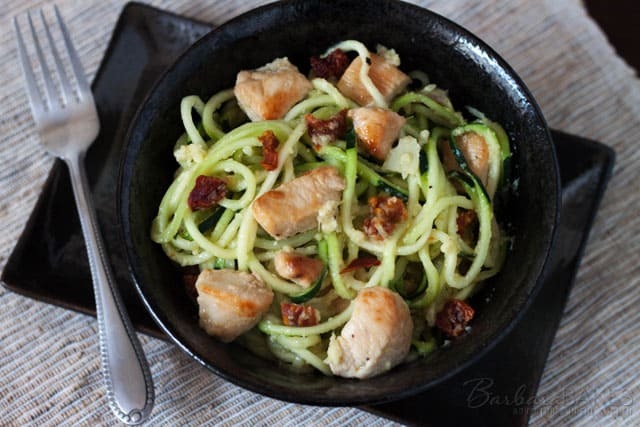 I love the zucchini noodles! We try to eat more vegetables, and they make it so easy. 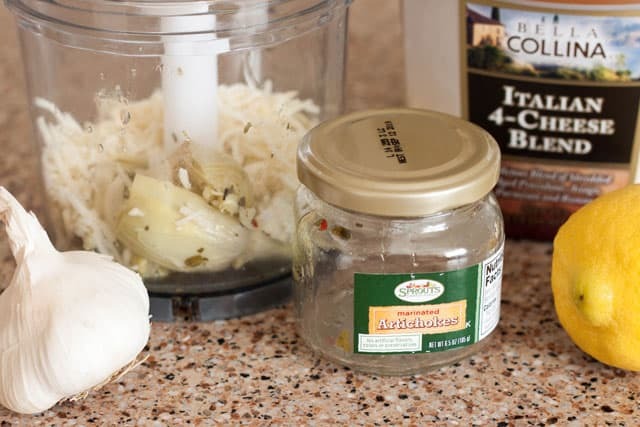 🙂 This artichoke pesto dish sounds like a perfect dinner to prepare after work- quick, easy and delicious! That looks so good……I love zoodles! And what a different pesto….I never would have thought of that combination-it sounds delicious. Looks great, and thanks for the shout-out for my Spiralizer Pinterest Board! Delicious and refined! A wonderful dish. John isn’t overly fond of pasta but I bet he’d LOVE this. I love everything about it and it’s good looking too.